The UN Global Compact’s CEO Water Mandate initiative has released the finalized Corporate Water Disclosure Guidelines – a common approach for companies to effectively and intelligibly disclose the many elements of their corporate water management practice to key stakeholders. The Guidelines are available as a PDF report and web-based tool. Launched in 2007 by the UN Secretary-General, the CEO Water Mandate is overseen by the UN Global Compact, and implemented in partnership with the Pacific Institute. Over the last several years, a proliferation of different water assessment and disclosure metrics and tools has become available. This array of tools and frameworks has been helpful in many respects, but has also resulted in significant confusion over what is valuable and meaningful to disclose and reporting that is often not comparable from company to company and year to year. The Guidelines – developed by the CEO Water Mandate in collaboration with CDP, Global Reporting Initiative, PricewaterhouseCoopers, and World Resources Institute– aim to harmonize reporting approaches, minimizing reporting burdens so companies spend less time on different reports and more time actively managing water. This work is the product of a multi-year, highly-collaborative effort, informed not only by project partners with expertise in water resources and corporate reporting, but also by business representatives, civil society organizations, and UN agencies. Download the water-related terminology paper. A key point that came to light in the development of the Guidelines was the need for a common understanding of the terms used to describe geographic locations with water challenges. To promote meaningful information and disclosure, the terms “water scarcity,” “water stress,” and “water risk,” often used interchangeably, have been precisely defined and incorporated in the Guidelines. Nine organizations in the water stewardship field collaborated to agree on these common definitions published in the accompanying water-related terminology discussion paper. Companies are fundamentally changing the way they address water. The Guidelines offer a common approach to disclosure, putting forward metrics that can begin to harmonize practice and also providing guidance to help companies define what water-related topics to report. Communicate these issues to stakeholders. The Corporate Water Disclosure Guidelines are designed to be applicable to a broad range of corporate water users, to capture the complex and location-specific nature of water resource dynamics and corporate action. Companies that are looking for detailed guidance on how to more effectively disclose the many elements of corporate water management will also find in the Guidelines response strategies they can take to address the risks, opportunities, and impacts that come to light in their assessment. Download the Corpoate Water Disclosure Guidelines (PDF). 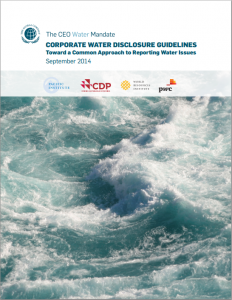 Download the Corporate Water Disclosure Guidelines Executive Summary (PDF). 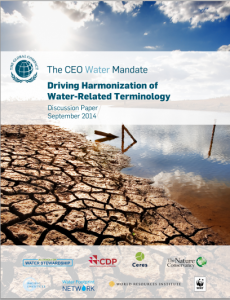 Download the Water-Related Terminology paper (PDF).